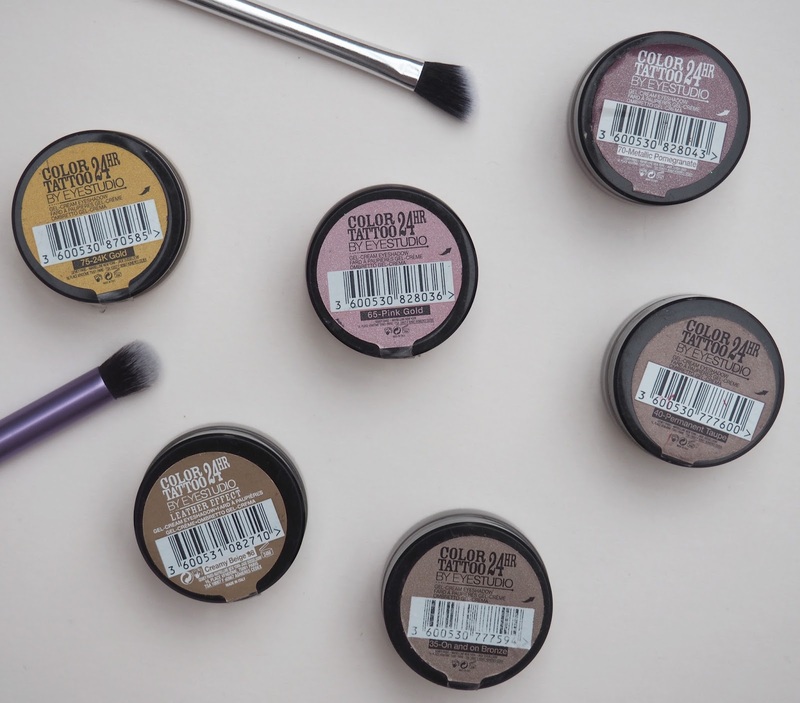 The Maybelline Colour Tattoos are one of my all time favourite drugstore make up products, in fact they are just one of my fave products in general. I'm sure I have talked about these before, probably several times, but I have never done a dedicated post on the colours I own and what I like about them, so here I am doing it! So whats the deal with these? 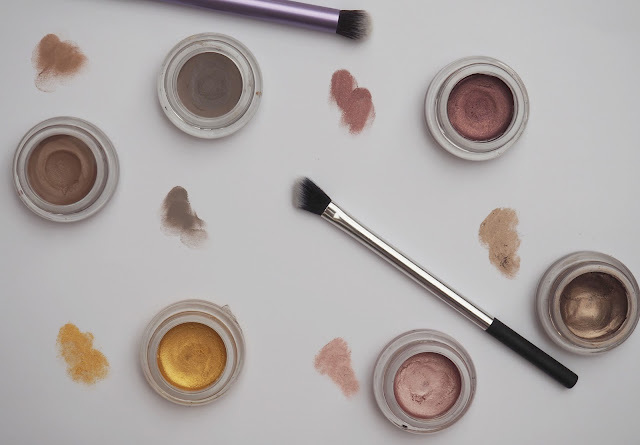 Well, they are cream eyeshadows that can be used as an eyeshadow base or on their own. Personally I tend to use them on their own by applying a wash of colour to the lid and blending the edges with a clean blending brush. However, from time to time I'll use them as a base colour and then apply powder shadows on top which works really well. I have collected a few different colours so lets start by going through the ones that have a shimmery finish. Metallic Pomegranate is a gorgeous purple, berry shade and what I like about this one is that the shimmer running through it is gold which gives the colour an extra dimension. On And On Bronze is my absolute favourite, as you can tell by the state of the pot, I just get so much use out of this and its definitely up there with my favourite eyeshadow colours. This bronze colour looks so flattering against brown eyes. The next one is Pink Gold and I have to confess I don't use this massively as I think that sometimes light pink shadows can make you look a little tired, however having now looked at this again it really is so pretty so I'm going to put this back in my make up bag and make it work for me. I'm thinking all over the lid with black winged liner, what do you think? 24K Gold is, well, gold. This is my least used colour and it wasn't one I purchased, I think I got it in a Glossy Box. For me this is just too yellow and not something I would feel comfortable wearing but I keep hold of it in case I 'need it one day'. These shadows also come in a few colours that are more of a matte type finish (no shimmer) which come in really handy, they work so well as a base to build on. Firstly I have Permanent Taupe which is a grey/ brown shade which is useful for creating a smokey eye. Creamy Beige is, you guessed it, a beige shade, it has a 'leather effect' finish but it all honesty the finish looks the same to me as the taupe shade. I do really like it though and use it a lot on lazy make up days, just to give my eyes a bit of oomph. You may have noticed that the packaging makes a pretty big claims about these little pots being 24 hour wear! Do I think thats a valid claim? Umm, no not really. Do I think it really matters? Again, no. Why anyone would need make up to last 24 hours I have never really understood but thats a different topic that I won't get into today. The wear of these ARE good though, very good. I find I get a little creasing after several hours but I get that in general as I have quite oily eyelids that love nothing more than to eat my eye make up. So, on the whole I would absolutely recommend these, I feel they are very comparable to the Mac Paintpots which are way more expensive than these little £4.99 bargains! As always, leave me a comment on what you think of these cream shadows.